Look Taller With These 3 Types of Shoes! If you’re a shorter man, you’re probably looking for ways to look taller. Unfortunately, it’s not possible to actually grow anymore, but there are other ways you can create the illusion of height — namely, with shoes. Read on to learn how to look taller with the right shoes — basketball shoes, dress shoes, and boots in particular. If you’re looking to add some inches to your height, a pair of basketball shoes are an excellent choice. In particular, Nike are a fashionable and affordable brand that make some great styles of basketball shoes. Basketball shoes can be worn on a day to day basis; they are of course comfortable and casual enough to be worn for long periods of time. Further than that, they’ll improve your performance if you actually are an athlete or play sport — taller height is a benefit in many sports, not just basketball. Wearing a pair of basketball shoes is such a good way of adding height since the soles are naturally a few inches thicker than regular sports shoes. They’re versatile and look good with many clothing styles, so you can wear basketball shoes confident they’ll complement your outfits nicely — as well as give you a few extra inches of height. The classic dress shoe is always a smart choice, but did you realize this style of shoe can also help you out in the height department? Dress shoes come in many different styles. When choosing the right one for you, it’s important you opt for shoes with a pointed toe over a round one. Pointed toes will help elongate your feet and your legs by extension, giving you the illusion of extra height. Dress shoes are a great choice of shoe for work, special occasions, and any time you require a more formal or professional appearance. 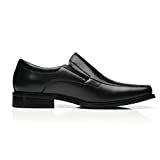 Another tip for extending your height along with wearing dress shoes is opting for fitted clothing. Tailored jackets, pants, and other items of clothing will help you look smarter, taller, and all around more polished. Boots are a stylish choice that can be dressed up or down, and there’s a few ways to wear them to help you look taller. Just like dress shoes, be sure to choose a boot with a pointed toe to help lengthen the feet and make you look taller. It’s also best to wear dark colored boots, such as, black, and pair them with similarly colored pants. Black boots and black pants will make your legs look longer and your whole body taller as a result. And if you want casual, everyday boots, opt for a pair of Timberlands. These classic boots look great — particularly with denim — and the large, sturdy soles will naturally give you a few inches of extra height. When it comes down to it, you should dress in whatever style makes you feel good. Once you have your wardrobe and the right shoes sorted out, you can start worrying less about your height. It’s time to let your cracking personality take center stage!